Bake a sheet cake the size that you need. 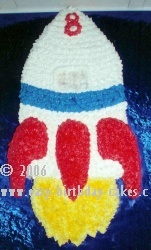 With an icing filled bag and round tip, size #5, draw the rocket ship on the top of the cake. Cut the cake away from the shape. Use the cut pieces to extend the flames of the rocket ship past the three red stands. You will use the star tip, size #18 for the entire cake. First fill in the window of the rocket with white icing. Now sprinkle the window with white edible glitter. Fill in the rest of the white on the rocket. Using the same star tip, outline the sides and top of the window. Make a medium blue color icing and fill in the blue band under the window. Make red icing and cover the three red stands. Now make yellow icing and cover the flames. Sprinkle the flames with yellow edible glitter. Finally on the tip of the rocket, put the age of the birthday child. With round tip size #5, write the birthday message on the cake board with white icing. You won't want to miss these other great pages!